At Emirates Hospital, we offer diagnosis, care and post procedural advice. We will create a successful and viable future plan for you according to your specific needs. At times, it becomes necessary for multiple experts to step in and work in unison because one part of the digestive system impacts the other. Availing gastroenterology treatment at Emirates Healthcare gives you a true appreciation of what personal care is all about. At Emirates Hospital Jumeirah, we offer holistic solutions while also focusing on technologically advanced and minimally invasive procedures. This vision of ours also extends to our solutions in the Gastroenterology department. Endoscopic Sleeve Gastroplasty (ESG) is a relatively new weight loss procedure started at in 2012, and now in use in a number of centers around the world. 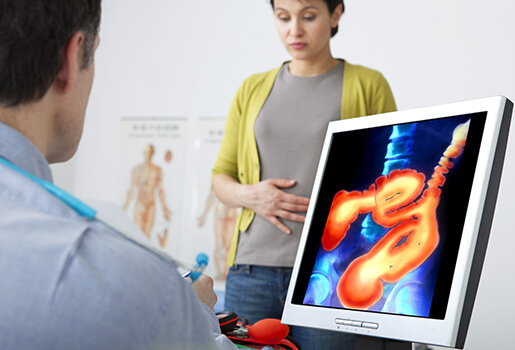 The procedure is non-surgical and is performed by a trained Gastroenterologist using endoscopic techniques in the hospital under general anesthesia. The risks of complications are surprisingly small. There have been no deaths documented with this procedure with well over 5000 cases having been performed worldwide. There are risks of bleeding and infection, however the total risk is less than 1%. No need for Endoscopy or Surgery or Anesthesia, it is engineered to have self-deflation after 4 months and passes out of the stomach and intestines by natural intestinal contractions. The procedure takes 15-20 minutes, where the balloon location confirmed by X ray.